Skipping breakfast gets my day off to a sluggish start. I’m a firm believer in breakfast being the most important meal of the day. My oldest daughter is 17 and I’m always reminding her to grab a quick bite to eat before she leaves for school. With my youngest daughter, Bridget, I like to give her enough time to sit and eat her breakfast before school. A healthy breakfast is the best way to prepare for a full day of learning and fun. It’s much harder to focus if your tummy is growling. I like quick and easy breakfasts for school days. Cereal is a popular choice in our home. One cereal my picky girls enjoy is Post Alpha-Bits which also happens to be a cereal I ate often as a child too! With Post Alpha-Bits cereal, there is a story in every bowl. I remember trying to spell my name with the Alpha-Bits shapes. Bridget also spells out words with her cereal and then wants me to take a look. I don’t mind her “playing” with her food because she’s practicing her spelling. Who knew breakfast could be so creative? I recently learned that Post Foods Canada Inc has revamped its Alpha-Bits cereal* with 40% less sugars than the original. It now contains 6 g of sugar per 1 cup. The original Alpha-Bits had 10 g of sugar per 1 cup serving. Plus, artificial colours have also been removed. I was happy to hear this news! I read labels and am concerned about feeding my kids foods with too much sugar. It’s a tough balance sometimes because my kids don’t want to sacrifice taste either. It’s still made with whole grain and has the same great taste kids love. Post Alpha-Bits cereal is a source of nine essential nutrients including iron, thiamin and fibre. It also has less sugars per serving** than any other leading competitive Sweet Kids cereal making it an excellent choice for parents and kids alike! I’m glad that Post Foods has made these positive changes to give parents a healthier option for breakfasts. My kids love sweet cereals so you can bet I’ll be picking up Post Alpha-Bits cereal at my local grocery store. Look for the new Alpha-Bits cereal at your grocery store beginning this month! Visit postfoods.ca to learn more about the new Alpha-Bits. You’ll be able to read more in depth about the nutritional information. They also have many yummy recipes! Do your kids enjoy Post Alpha-Bits cereal? *New Alpha-Bits has 6 g of sugars per 1 cup (30 g) serving size compared to original Alpha-Bits with 10 g of sugars per 1 cup (30 g) serving size. ** New Alpha-Bits cereal has 6 g of sugars per 1 cup (30 g) serving vs. 9 g of sugars or more per stated serving size in the leading competitive brands in the Sweet Kids segment based on top 10 Franchise $ Share ranking in the L52weeks to August 22, 2015. I bet my boys would love this cereal. They’re all about learning their letters right now, so this could make for some morning cereal fun! 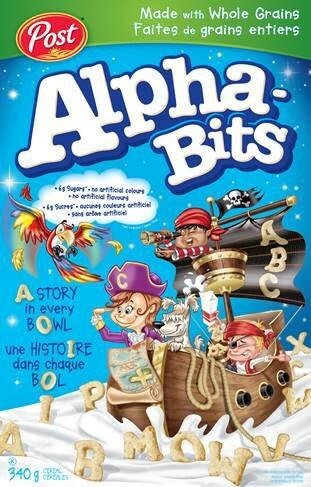 I loved Alpha-Bits as a kid! One of my kids is a “cereal connoisseur” and this is one of her favorites, she does prefer to eat them dry because it’s “easier to make words on the table than in the bowl”. I have always love Alpha Bets. I actually forgot about them. I want to try them again and have some fun with my kiddo doing it. Thanks for the reminder! i loved the cereals of the 80s! My brother loved Alpha-Bits as kids. It is nice to know that Post has made them a healthier choice. This was one of my favorites as a kid too, so they have been around along time! I’m glad they are taking steps to make them healthier. This is one cereal I have never tried, even as a child, hmmmm maybe I will have to get a box, it’ll be good to have around for the grandkids too!! I’m glad to hear this! It was one of my favorites, but I quit eating it because it had so much sugar – will have to try this new formula! I used to love Post’s Alpha-Bits! I didn’t even know that they were still on the shelf… I will have to check it out again. Great changes that they have made. It is one cereal we do buy every now and then as a treat! I picked up a box of these at the store yesterday. Can’t wait for the kids to try them. This is one of the few treat cereal I buy. I think my kids would enjoy this cereal! I will have to try it out! They love alph-bits because it is so much fun to make words with the letters! sure aren’t 30 gram bowls in that picture, and 6 grams of sugar in 30 grams of cereal is still high considering that most people eat way more than 30 grams at a time. Although this is one of the lower sugary ones. We never had cereal in our house growing up. Yes, they do and I do too! I will be buying these, I like that there’s less sugar. Thanks! 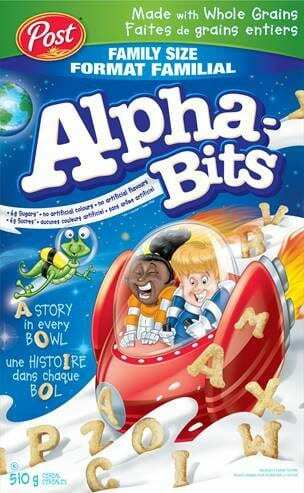 I use to love Alpha Bits when I was a little girl and I just know my kids would enjoy it too. Oh, the memories! I loved this cereal growing up. Making words then eating them. They’re still delicious. Just had my first taste of the new formula and it taste awful !! Why could they not do like the pop company and add a diet version of the cereal and keep the sugar one for us sugar lovers. I was excited to see alpha-bits in the store again. I got them for my granddaughter and decided to have a bowl myself. Yuck, yuck, yuck! I was so disappointed!! Nothing like what I enjoyed as a kid. It’s not just less sugar, but the whole thing is very different. I won’t be buying them again. I enjoyed Alpha-Bit cereal as a kid – my favorite cereal in fact. I also enjoyed the cereal as an adult until I encountered the new version. I am really disappointed. The new version tastes bland and completely different than the original (which I tasted the day before). The texture is horrible. I feel as if there is something like cotton stuck in my throat when chewing. I MAY continue to purchase it if it is liked by my kids, who have not tried it yet. I have my doubts. I agree with Paul, why not have both versions – a diet/low sugar version and the original.